Many clothes were made from wool and dyed with natural dyes from plants and berries. Wool from sheep was spun into threads using a drop spindle. This was a notched stick with a weight at the bottom (spindle whorl) to help the spindle to turn when spun round. The woollen threads were then woven by hand on a vertical loom to create a cloth, probably decorated with intricate patterns. This cloth could then be cut and sewn together to create tunics, cloaks and trousers. Clothes would have been fastened by using broaches and pins, made from bronze, iron and bone, many of which survive to be recovered by archaeologists today on Iron Age sites. 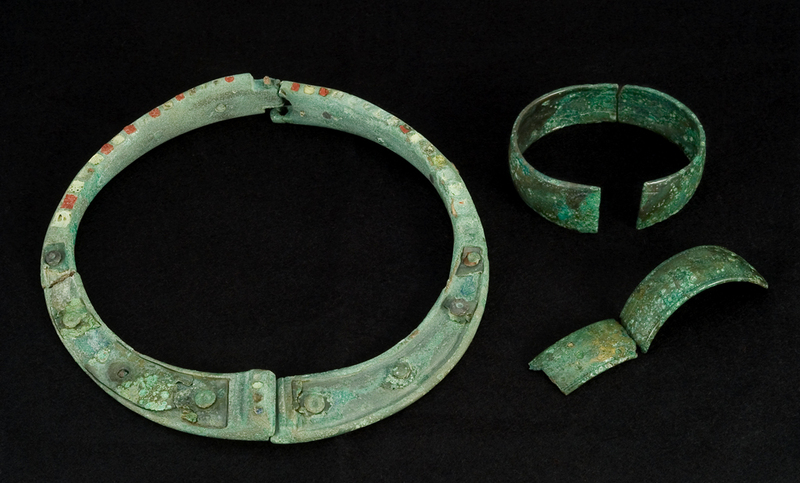 SomeIron Age men and women would also have worn anklets and arm rings made of metal or shale. Perhaps the most distinctive decoration would have been the torc. Possibly a symbol of status, ethnicity or power, the torc was a ring of twisted metal, sometimes elaborately decorated and made from precious metal such as gold, and worn around the neck.